I’m back. We’re back. The madness that was the Easter holidays is over. Term started on Monday and we’ve got our heads down and we’re embarking on the next big thing. Which is…. But hang on a minute. Haven’t I forgotten something? ‘What about the planting combinations file?’ I hear you cry. The will-she-won’t-she cliff hanger I finished with at the end of last term. Did I get it done in time? Did I hand in the folder with the ten planting plans, (six set by KLC, four chosen by us,) the ten elevations showing a cross section of each plan with the individual plants sketched in by hand,and the ten tables with each individual plant listed with a description, characteristics and special considerations. YES I DID. And let me tell you something….. It practically killed me. I got back from Nepal on the Sunday night. I took a day to recover from jet lag, exhaustion and Nepalese tummy (which is showing annoying signs of wanting to stick around). Then I shut myself away in my little shed in the garden. And didn’t come out again for six days. Except for food, sleep and the odd nervous breakdown. I had handed in six plans and elevations at the end of last term for Annie Guilfoyle to cast her eagle eye over. After receiving her comments the six plans all needed redrawing! So in six days I drew up four new and six revised plans, inked them all in, labelled them, sketched four elevations, and did eleven plant tables. Not ten. Eleven. Because somehow I managed not to save the table for the Moist Soil by a Lake or Stream, Soil neutral PH – AND I HAD TO DO IT AGAIN. I copied them all, printed them all out, spent hours trying to slide each individual sheet of paper into those infuriating plastic holder things that crumple up and crease and generally make life even more difficult than it is already….. But I did it. There I was on Monday morning, with everyone else on the course, handing my precious folder into Humaira at ten o’clock (any later and we get penalised by losing marks). It’s not perfect. I was working flat out and with no time to spare so mistakes were made. So I’m not going to get a great mark for it. But the great Planting Combinations Project – which seemed so innocent and unassuming when we first heard about it – is done. And now it’s on to the next thing. 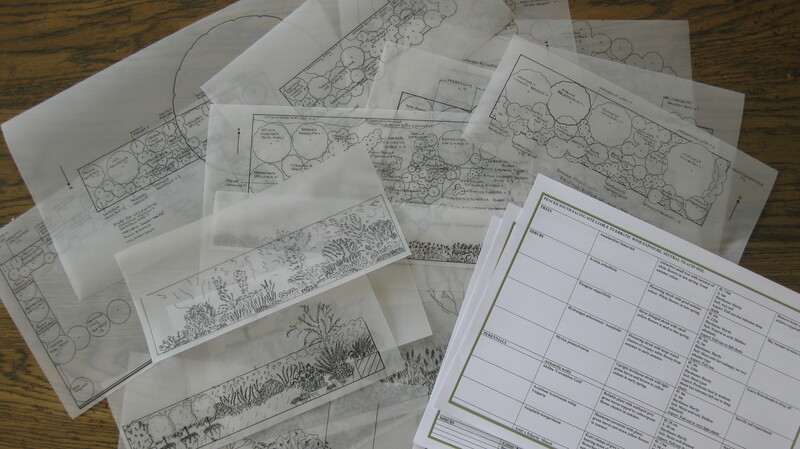 On Monday we were given our next project – coming up with a design for a concept garden for the Hampton Court Flower Show. We’ve got two weeks for this one….. And on Tuesday we were set our Construction File project – which I’m very much hoping isn’t going to be in the same league as the Planting Combinations File…. But you never know. This workload for this course is insane. Great things are expected of us. Great things are demanded of us. And you know what…. I wouldn’t have it any other way.